Greuel, the City Controller who is battling City Councilman Eric Garcetti to be the next mayor of Los Angeles, took a moment to yesterday to highlight what many Angelenos already know. There is not enough freeway space for the number of people that want to, or feel forced to, drive to get where they need to go. That statement is doubly true for the 405. Maybe the next mayor should do something about it. One issue that both Garcetti and Greuel agree on is that further widening of the I-405 through the Sepulveda Pass, one of the few transportation links between the populous exhurbs of the Westside and San Fernando Valley, is a fool’s game. Both advocate for a strong and real transit alternative to driving on the 405. And advocates agree. David Murphy is the head of Angelenos Against Gridlock (AAG). In the past weeks, AAG earned a lot of media attention by attacking the widening and revealing the celebrity support of Elon Musk for highlighting how far behind, and over budget, the 405 widening project is. But Murphy’s group isn’t arguing for further widening, but for rail expansion. “What does all the attention to the 405 traffic, including even on Good Morning America today, say about the need for rail?” Murphy asked rhetorically in an email. While both candidates agree that transit is the best way to move people through the pass, they each offer different solutions. But Garcetti doesn’t think light rail, even supplemented with other transportation options, is the answer. At a recent candidate forum broadcast by CBS 2/KCAL 9 and hosted by the National Council of Jewish Women Los Angeles and Bend the Arc, Garcetti made the case of a major investment in heavy rail, or even a subway through the mountains. While a tunnel may sound cost prohibitive, Greuel hasn’t ruled out the tunnel option. She noted that it might actually be easier to tunnel than build on or near the 405 given recent experiences. Click on the image to see a full sized pdf of the GEM Line. Despite the higher cost of heavy rail, the plan does have backers in the transit advocacy community. The Transit Coalition proposes a “JEM Line” of heavy rail right through the mountains. Their proposal incudes stops throughout the San Fernando Valley starting at Sylmar and ending on Ventura Boulevard. Then there are another four stops on the Westside, including one at UCLA. Whether it’s Greuel’s transit mix or Garcetti’s heavy rail, the conversation sure has changed from a couple of years ago when then-Governor Schwarzenegger suggested double-decking the freeway. However, to move a project for the Sepulveda Pass is going to require some political muscle. True, there is funding for a transit project for the Pass in Measure R, but under the current funding plan funds wouldn’t be available until the third decade of funding from the half cent sales tax. Again, both Garcetti and Greuel have pledged to work hard to accelerate construction of transit projects, but Mayor Antonio Villaraigosa can tell you that’s a lot easier said then done. Despite assembling a national coalition of mayors and transit advocates, the Mayor’s famous America Fast Forward program acheived only modest reforms of federal funding formulas. All the logic in the world will be dashed against the rocks when pushed up against the short-sightedness of the House Republican Caucus. And without reforms that lower the 2/3 voter threshold needed to pass another transit tax, or an extension of the current one, it’s anyone’s guess whether another tax proposal would just pass the threshold as Measure R did in 2008 or just miss as Measure J did in 2012. Garcetti agrees that it is important to find other ways to accelerate transportation and transit projects and has suggested that a second run at Measure J might be one of the best options. Now we need a follow-up story on the madness coming out of Metro for this project: freeway tunnels from the Valley to LAX! When we say there is no money for transit, we don’t really mean there is no money. It is just that we don’t spend it in the right place for the right things. Incorrect, it’s worse than you think. We just spent 1.2 billion on adding ONE carpool lane (northbound) only. Crazy, huh? That should be JEM line. Jobs. Education. Medical. If people have hard time getting to rail without cars, they drive. Some people will argue, it will reduce the freeway congestion. Isn’t traffic so bad in WLA locally. Also, if people can’t get around WLA easily without cars, they will drive. I know many people who hate traffic and take train/buses gave up because local bus service stinks. None of politicians will address that issues. Even Streetblog (the so call public transit advocates) does not endorse rail system with good local bus service. Oh, don’t forget many students don’t have money to own cars. Garcetti is right. If you offer the opportunity to get from the Valley to Westwood in six minutes, you’re going to have more demand than light rail can hope to fulfill. Nobody wants to spend billions on another traffic jam. Car or human. Heavy rail subway is probably the best, long-term solution. It could easily move hundreds of thousands of passengers during rush hour. Connections are the key. Any Sepulveda Pass subway would need to connect with the largest feeder lines on either end. On the South side, that means the Purple Line extension. On the North, the Red Line. The Red Line connection would mean one of two things. Either creating a spur or terminus of the Sepulveda Subway in North Hollywood, or building a new Red Line spur or terminus in the Van Nuys area. Neither option would be cheap, but I believe picking one of them is essential to the success of the project. The Orange Line is already facing a capacity ceiling. Throwing more buses on the busway is up against the diminishing returns of close vehicle headways and bunching. A Sepulveda Pass subway would dramatically increase demand for East to West service in the Valley. The effect would be like hooking up a garden hose to a fire hydrant. It works, but the line is completely overburdened and failure is only a matter of time. I believe, underground LRT (with at least a 3-car train) would make most sense. At least because it will be a continuation of the San Fernando Valley / Van Nuys corridor project. Theoretically, subway (HRT) trains would be the best to handle capacity, but then – if you have HRT on the Sepulveda corridor, and then LRT on the Van Nuys corridor, this would require a transfer. So, I think – by implementing the LRT trains on both the Sepulveda Pass and Van Nuys, one day riders will have a one-seat ride form Sylmar to Westwood without (!) a transfer. A San Fernando to lax heavy rail will cost probably 15 billion. I think very worth it but I dunno where the money is going to come from. So there will have to be at least 5,000 new housing units around each station for the cost of heavy rail to be justified vs. all the worthy projects in the region. Are all the politicos and Valley activists ready to support that? Why not just upgrade the Orange Line to light rail? A lot cheaper than building heavy rail between Van Nuys and North Hollywood. We need to stop “fighting” traffic, imagining that we can build ourselves out of it–whether with highways or subways–and we need to start managing it instead. If subways were really the answer to “traffic relief”, why is traffic still a problem in the cities that have them? What we need are more ExpressLanes that will boost bus service and reliability, encourage carpooling, and put a price on solo driving. We need Bus rapid transit (BRT) that runs in its own lanes, runs every 1-2 minutes, and fans out in the valley to serve the entire area, not just a few subway station hotspots. To meet LA’s actual transportation needs any time soon, we have to stop burying our heads in expensive subway sand. We already have a one-seat ride from Sylmar (Pacoima) to Westwood: Metro Rapid 761. It’s not fast, but it could be if it ran on dedicated or managed lanes, which would cost much less than LRT and much, much less than HRT. Only if you live in the subway train, and your final destination is in the subway train, would it take you 5-10 minutes to go from Sherman Oaks to UCLA using a subway. Typically, you have to get to the train station. Go down to the train platform. Wait for the train. Then exit the train tunnel and then use some other means of travel to arrival at your final destination. Rail does not offer door-to-door service. Heavy rail seems to be a logical pick since it could connect to the Purple line that will end at the VA hospital. But, the expected amount of transit users does not qualify it for federal dollars. So if that is the choice, then there would have to be much more money coming from the local level to pay for it. If there is either BRT or rail going all the way to San Fernando Rd along Van Nuys Blvd, then there will not be enough room left over to put in 5-foot wide bike lanes where the transit stations would be located. Short changing bikeway infrastructure at every transit stop would effectively limit the bicycle riders on this street to only the fearless who would be willing to ride in mixed traffic. A better alternative for a complete streets solution would be to have the BRT or rail run along Van Nuys Blvd south of the Orange Line, then along the Orange Line right-of-way and then continue north along Sepulveda Blvd. This is the alignment for a street car line that used to run in the SFV. The problem with sharing the Orange Line right-of-way is that the Orange Line is already running near capacity. Perhaps the shared segment is short enough that it wouldn’t interfere with signal times, but that’s not clear to me. It is true that subways do not solve gridlock (only congestion pricing does). But they make gridlock a smaller problem for the population as a whole, since a higher percentage of the population does not experience the gridlock when they travel on the subway. It seems to me that they’re already planning LRT from the Green Line to Crenshaw, and LRT is a possibility on Van Nuys, it makes sense to develop all three of these segments together as a unified line using LRT technology. If you want heavy-rail-like capacity, you could build in longer platforms and run longer trains. Building a subway with two light rail lines on the end seems dumb and inefficient. I resent the Westside or the Valley being called exhurbs. Much of the Westside and the Valley are within LA city limits. It takes me 15 minutes on a good day to get to downtown from the Westside. It’s a horrible journey. Even without any traffic, the 761 slowly climbs through residential neighborhoods on Sepulveda, rattling and shuddering and taking all damn day. As someone who lives on the Westside and has experienced the 405 far too often, I am desperate for a reasonable alternative. For the sheer crush of people trying to get over the Sepulveda pass every day, I am all in favor of a heavy rail line. The Westside being such a job center and the 405 acting as a funnel into it, I’m more than certain that the fast, frequent service would be immensely popular. Light rail is acceptable but still too slow and limited for the infrastructure this part of the city requires to meet future needs. Light rail and busways are great — but they simply don’t match up to the efficiency and capacity of heavy rail. Its my understanding from attending several of the community outreach meetings that there would be an additional busway built along the Orange Line corridor if they chose to use Van Nuys Blvd and Sepulveda Blvd as the north/south alignment. Expected ridership of a Sepulveda HRT is similar to the Purple line extension. Sepulveda Pass is most congested freeway in North America with >500K potential daily riders (not counting population growth over th next 30 years) I’m not a federal grant expert, but logic says that if anything would qualify for transit dollars, this project would be it. At some point, we have to accept that demand exceeds what a bus can deliver. Other cities realized that over a hundred years ago. It is time the few in Los Angeles who still hate trains woke up to the reality of living in a dense city. And just to clarify, the Orange Line is over capacity during peak periods (the time that matters most). The only legal way to increase capacity without decreasing travel times according to the MTA and FTA is… converting to rail! There is simply no way to convert the Orange Line to rail without getting approval at the ballot box for more tax money and even then it would probably involve completing the Measure R projects first (which would take at least 10 years). Heavy rail is a lot more expense to built than light-rail. The Purple Line extension is expected to cost a half a billion dollars a mile. There is only one billion dollars set-aside for the Sepulveda Pass project, which is not enough to complete a tunneling project without some sort of a private/public partnership (a toll road and a train project perhaps). There are lots of projects that Metro would like to build but they simply do not have the money for it. The public comes up with these costly ideas for projects but they do not seem to realize that the money would not be there to build it without the needed voter approval at the ballot box to tax themselves some more. There is only one choice, Heavy rail from Sylmar to LAX along Van Nuys Blvd Westwood or Century City, Westcheter and LAX where not only it reaches the airport, but a transit hub with the Crenshaw, Green line and the new LTR Line to the South Bay as well as other transit service, Over one Billion dollars has been spent to widen the 405 through the pass and within months of competition traffic will be back to pre-construction levels.more traffic lanes are not the answer. The orange bus line needs to be upgraded to a LRT line. Double the capacity, half the running time end to end and less expensive per passenger mile to operate. It would also block less traffic at cross streets. Anyone who favors BRT, just take a ride on the orange bus line, then ride a LRT line and see the advantages of LRT over BRT..
A subway would be nice for those who live and work close enough to it (a small percentage of the population), but will not so nice when it adds transfers to trips, siphons funds from transit service elsewhere, and induces car usage for people who have to drive to and park at stations in order to use it. Subways are great for NYC. In LA, BRT and LRT make much more sense. That is a massively expensive proposal. $1 billion buys you about 2 miles of heavy rail subway. How many miles is Sylmar to LAX? That’s a lot of $ billions. BRT has several advantages: it’s street level, easy to get on to and off, it can be built quickly and cheaply, and, if it’s run properly, there’s typically less wait time between buses than between trains. It needs to be heavy rail, if LA wants to take public transportation seriously, and act like a metropolis. However, I’d like to see some numbers from planners. Heavy rail could carry twice as many passengers (ballpark figure, I’ll admit) but I doubt wouldn’t be twice the cost. If you need to tunnel with either option (which costs a ton of money) I suspect that heavy rail will be more cost-effective. Plus you need to consider “off-the-books” economic benefits, such as increased real-estate values, higher-density rental footprints etc. Plus, you know, it’s a better option for traffic and the environment. We have heavy rail under the Cahuenga Pass. Therefore we also need heavy rail under the Sepulveda Pass. Then we wait. If we waited for rail on the Orange Line we’d be experiencing one seat train rides from Sherman Oaks to Downtown today. We could also have rapid buses on Sherman way until the rail was built and we wouldn’t have lost anything (yes, the orange bus is that slow). But now, we have over capacity orange buses that travel slower then Ventura blvd. without any plans for a needed orange line. We definitely should wait until the money is ready for van nuys rail. 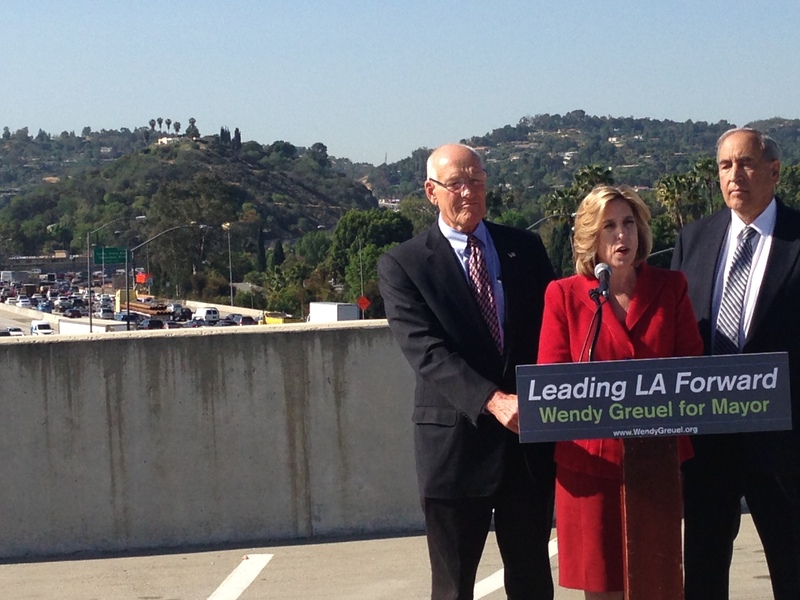 A rail tunnel thru the Sepulveda Pass is the most critical transit decision of the next 50 years. You have to do it right. You need alacrity, speed and connectivity. Subway seems best solution for Westwood to Ventura or Orange Line but this only seems to make sense if it was an extension of Purple line (ie a 1 seat ride). The full run from Sylmar to LAX seems to be either LRT or even more of a commuter line (fewer stops, express service). Perhaps a service that could blend seamlessly with an electrified Metrolink all the way to Palmdale, and maybe farther south along Harbor subdivision to Long Beach. This is long term stuff but you have to get the tunnel done right. Maybe a 3 Track or even a 4 track tunnel that can accommodate two echnologoies. I hope that they are considering HRT that is elevated on some sections and underground on others. It doesn’t need to be all underground. 48 miles from my house Sylmar to LAX.